A nuclear factory employee named Karen Silkwood (Meryl Streep) is distressed to learn that her company may be engaging in less-than-safe practices — but as she becomes more active in her local union, she finds herself increasingly isolated from her co-workers, who fear loss of their jobs if the factory shuts down. Meryl Streep’s Oscar-nominated performance firmly grounds this disturbing biopic about labor union activist Karen Silkwood, whose mysterious death in a car accident while on her way to meet with a reporter remains one of the most notorious instances of “whistle blowers” meeting an untimely demise. 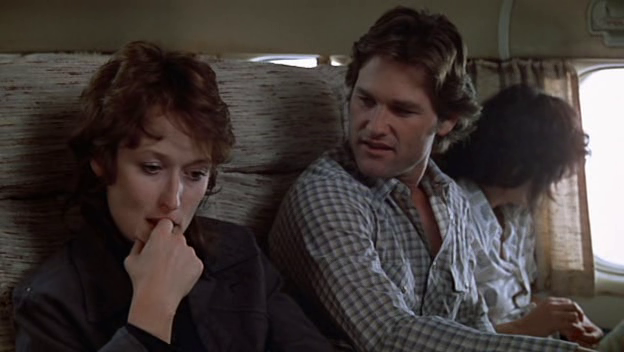 Given that viewers know the outcome of this real-life tragedy in advance, director Mike Nichols (working from a script by Nora Ephron and Alice Arlen) wisely frames his story as both an ethnographic look at Silkwood’s working-class existence — she’s estranged from her kids, living with her boyfriend (Kurt Russell) and lesbian friend (Cher) — and as an unsolved mystery story (is someone contaminating Silkwood on purpose?). Streep, naturally, is phenomenal in the title role, providing a nuanced portrayal of a woman who’s both easy to like (she’s amiable and free-spirited) and easy to hate (she’s mildly manipulative and not easily deterred). What’s most fascinating about her story — other than seeing how close-to-the-edge she and her co-workers live on a daily basis, given the dangerous work they’re doing — is watching Silkwood’s consciousness slowly growing, as she uncovers more and more instances of suspiciously neglectful and/or deceitful behavior on the part of her employers. 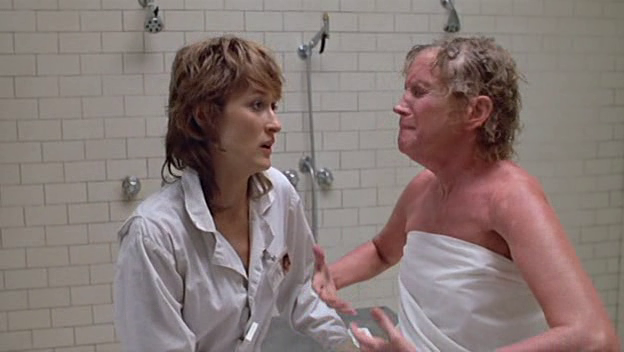 The “scrub down” showers — shown being given to Silkwood herself and to a terrified co-worker (stage actress Sudie Bond) — remain among the most horrifying scenes in non-horror cinema. Note: Click here to read a follow-up story in People Magazine about the various individuals in Silkwood’s real life. Yes, as an all-around good show, and for Streep’s Oscar-nominated performance. Must-see – a rare biopic that holds up well on repeat viewings – and, yes, bolstered by Streep’s powerhouse performance. Nichols is a real ‘actor’s director’ and, in his best films, he gets on-target work out of everyone. (He quite often seems to have highly skilled casting directors.) Certain actors in the industry have never (or rarely) been better than when they worked under Nichols’ care. Cher, Russell and Diana Scarwid are so much more effective in this film than they tend to be elsewhere, each of them offering intriguing layers in their roles. All that said, Streep (as is usually the case) is running this show. Since Streep tends to be on the knockout side no matter what film she’s in, it’s a special treat when she goes the extra miles, as she does here. It’s almost as if – out of personal compassion – she took it as her special mission to faithfully channel the spirit of Karen Silkwood as closely as possible. 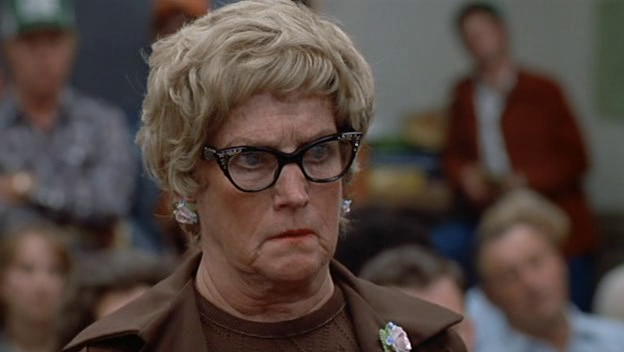 I happen to think she is scary-good in this film. I’ve also watched a few documentaries on the Silkwood case, and it’s apparent that Streep was singularly committed to the project. This is a rare film that thoroughly captures the loneliness of and backlash toward a committed whistle blower. 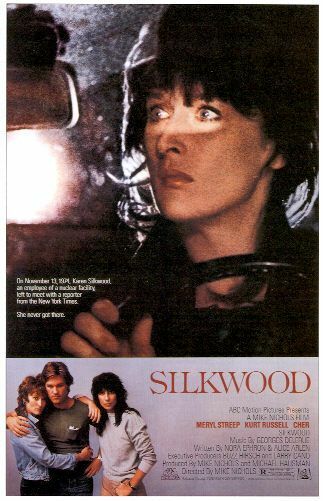 It’s possible to watch this film and find yourself wondering…what snapped inside Silkwood? What light went on inside her? Did she look at her life at a certain point and think that it wouldn’t be much of anything unless she threw herself into something that would make her feel alive?, useful?, productive?…something that would finally give her life the meaning she’d been trying to grab on to? It often seems that the people who ‘wake up’ and look at certain realities with their eyes wide open, and then fly in the faces of convention or apathy end up paying an unanticipated price. This is a movie I could continue to watch – perhaps even once a year – and always find it gripping and moving.